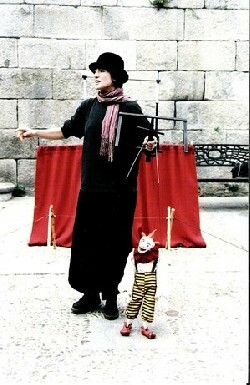 Paz Tatay is a puppeteer since nineteen eighty-eight, she co-founded Marionetas del Matadero with Luis Montoto; they worked exclusively with string puppets. The show created in 1992, “Tauromaquia”, about love, corrida and death, is payed by the Company yet. 1996 / Le cirque de passage (The Travelling Circus), exhibition of string puppets. 1998 / La Muerte de Don Cristobal (The Death of Don Cristobal) for gloves puppets on the figure of an old Spanish Pulcinella celebrated by Federico Garcia Lorca. 2005 / A la Dérive (Drifting) carried puppets, shadows, projections and fool’s baubles on the theme of clandestine emigration. 2009 / Les Funestes Epousailles de Don Cristobal, The Grievous Marriage of Don Cristobal), second episode in the adventures of the old Spanish Pulcinella. Paz Tatay, of Spanish origin, works the puppet since 1988 and bases the company of puppets Marionetas del Matadero with Luis Montoto; they dedicate themselves to the puppet has thread. She creates the company Pelele in 1996 in Toulouse. 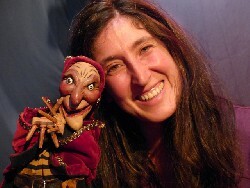 Marie de Nazelle works the puppet since 2002. She creates her company " Pil poil au millimètre " in 2007 and joins the Company Pelele in 2009 for the creation of the show " Catastrophic courtship of Don Cristobal ". Christophe Sabatié is a musician multi-instrumentalist and works with the Company Pelele since 2007. He conceives the music of the last show, the sound effects to give atmosphere and rhythm. He works also with several musical formations.